The very last of Mamaw’s pound cake and the three-layer fig cake. “My mother likes to use recipes,” said our youngest daughter to her friend in a tone that implied I abuse kittens. Both of these young women are the kind of intuitive cooks that fix what’s in the cupboard. Me, not so much. I’ve never been an improviser — at the piano, on stage or in the kitchen. That, of course, is especially true of baking, made more difficult around here by the fact that our 23-year-old gas oven will not hold a constant temperature. Baking, so goes the cliche, is a science while cooking is an art. In our kitchen, you bake on a wing and a prayer. This beloved child and my husband, Vlad the Plaid, share a January 20th birthday so when she came home this week, I made a cake for each. He wanted our neighbor’s dried figs ground into a fig-orange and almond layer cake filling. This extravaganza included cooked icing more like divinity than frosting. The Hamster, who will be 22 on Sunday, got Jean Easter’s Mamaw’s Poundcake, second prize-winner from a 2006 contest in the Winston-Salem Journal. 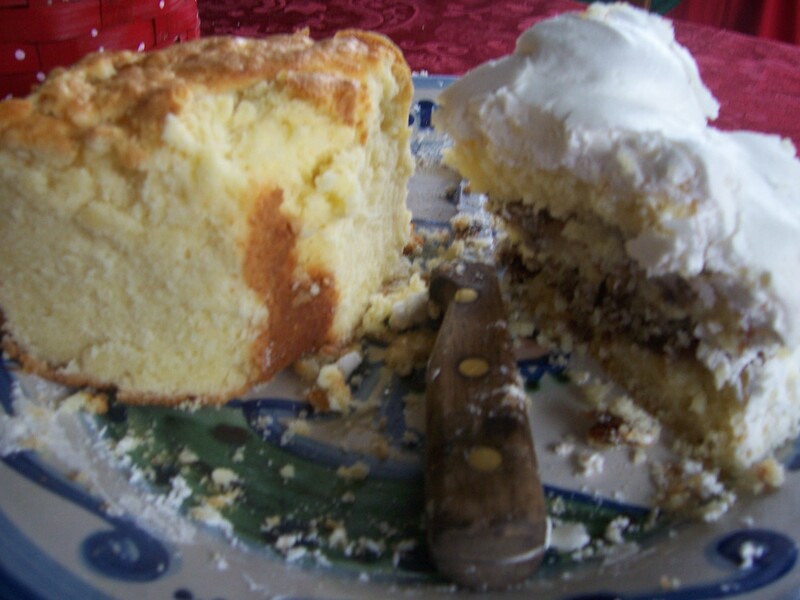 It is a practically perfect poundcake, crispy on the outside and tender but dense inside. Coconut, butter, vanilla and lemon extracts give it a distinct, sweet taste that is a combination of all 4 but somehow different. The Hamster’s buddy said it smelled like popcorn because of the butter flavoring, but if it had been a wine, we’d say it had “notes” of the other three as well. The only changes I made were the substitution of real butter for margarine and cake flour for all-purpose. The crumb was fine, moist and even. Cream butter, cream cheese and sugar until light and fluffy. Add eggs one at a time, beating well after each addition. (The air you beat into this mixture is most of the leavening in a poundcake.) Add extracts; beat until mixture is lemon-colored and smooth. Spoon batter into prepared pan and bake 1-1/4 to 1-1/2 hours, turning pan at midway point to prevent a “sorry streak” (undone places). Cake is done when tester inserted into thickest part comes out clean, top is golden and beginning to crack. Cool on wire rack in pan for 10 minutes, then turn out to cool completely. Makes 20 to 24 very, very rich slices of several thousand calories apiece.